In a quest to remove as many toxins from my life, I've slowly begun swapping out commercial products for homemade or store-bought alternatives made with non-toxic ingredients. And now that summer is upon us, I know folks will begin stocking up on summertime essentials to protect them from the heat and stay hydrated and smelling fresh when they're outdoors for hours. I used to do the same thing. Until I started paying attention to the ingredients on the labels. Or at least those that are listed. The cosmetics & personal care industry does not have to disclose all their ingredients (like fragrances). That means lots and lots of chemicals. For the same reason that I avoid processed ingredients like high fructose corn syrup, soybean oil, canola oil, modified food starch, MSG, dextrose, carrageenan, soy lecithin, artificial colors, etc., I don't want to put things ON my body that might harm me in the long run. So I'm making it my mission this summer to take small steps toward a more natural life, while also keeping it easy and fun. If you'd like to do the same, pick one thing on this list and make a change! When summer’s in full swing, most folks spend hours outdoors and you know what that means -- lots of unwanted attention from chiggers and mosquitoes, plus lots of exposed skin. The two go hand in hand so well that I can’t imagine summertime without conjuring images of itchy chigger bites and pink, peeling skin. But, it doesn’t have to be that way! With a little foresight and planning, you can craft your own non-toxic citronella spray and summertime lotion bar with essential oils. That means you can kiss your commercial bottles and spray with questionable ingredients goodbye. And for those times when you’ll inevitably forget to apply spray and lotion before heading out on summer adventures, this homemade balm is handy for rubbing on sun kissed or bitten skin! Popular sports drinks like Gatorade and Powerade (just to name a few) are nothing more than glorified sugar water with unsavory ingredients like brominated vegetable oil, modified corn starch, artificial flavors, artificial colors and artificial sweeteners like sucralose and acesulfame potassium. Ditch 'em and make your own homemade citrus electrolyte drink with five simple ingredients. The vast majority of bottled teas (and drinks in general) sold at supermarkets, convenience stores, restaurants--you name it--are sickeningly sweet and contain corn syrup and artificial ingredients. Skip them and save LOTS of money by making your drinks at home in large batches and bottling them up in portable containers. Try my super easy cold brew iced tea recipe and homemade raw honey lemonade recipe for starters. Another great option for hydrating and replenishing electrolytes is coconut water. This is my favorite coconut water because it has less sugar than all the other brands I've tried. When I'm splurging, I buy a bottle of this 100% raw coconut water (the best ones are pink) from the health food store. It tastes just like the fresh stuff. When the temps are soaring, ladies (and even gents) who wear makeup like to keep it light and simple. No one wants foundation streaking down their face or smeared eyeliner while they're sweating under the sun. 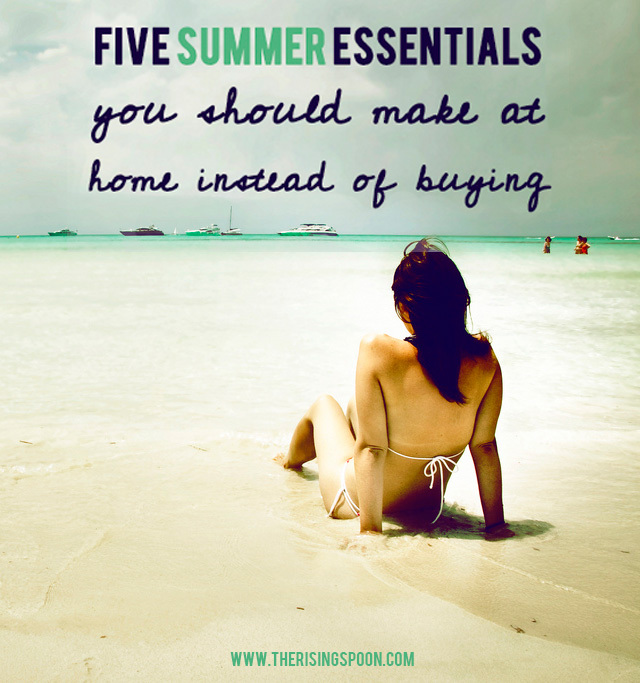 Hence the extreme popularity of products like bronzer, lip balm and mascara in the summertime. I only wear makeup on occasion and when I do, these are what I opt for since they accentuate without being too flashy. Did you know you can make all three of these products at home with non-toxic ingredients? Makeup is SO overpriced, so it'll save you lots of money and you can control exactly what goes onto your face and body! First snag a few empty DIY containers like these 4 oz mason jars, lip balm tubes, lip balm tins, and mascara containers with wands so you can store these recipes at home and take them on the go. Then, check out these homemade tutorials for bronzer, lip balm and mascara. For even more DIY beauty recipes (that have been tested so they work), I highly recommending grabbing one or both of these e-books: All Natural Living: 75 Non-Toxic Recipes For Home and Beauty by Robin Konie and DIY Organic Beauty Recipes by Heather Dessinger. Both of these books will save you hundreds (maybe even thousands) of dollars a year by teaching you how to ditch commercial beauty products and cleaners for homemade alternatives. Even though the air is more humid in the summertime, it's still important to moisturize your skin. 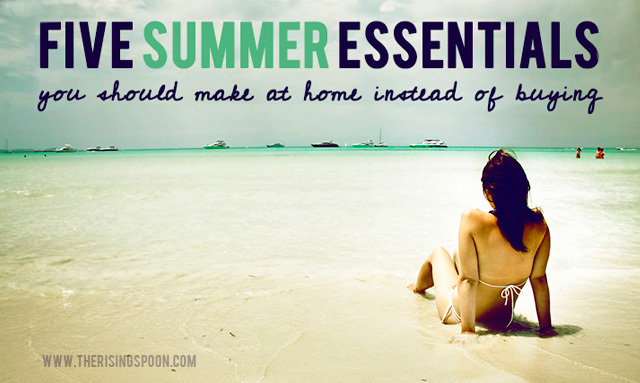 Especially if you're spending extra time in the water or sun. Homemade moisturizers are so easy to make that it's ridiculous to spend $10-20 on a bottle of perfumed lotion. Especially when the main ingredients in nearly all of them (aside from water and glycerin) are potentially harmful ingredients like parabens, phthalates, propylene glycol, synthetic colors derived from petroleum & synthetic fragrances! About once a week I like to exfoliate in the shower with a homemade lemon sugar scrub or coffee sugar scrub containing therapeutic essential oils and grapeseed oil, which leaves my skin glowing and moisturized. The other days, it's as simple as smearing on some coconut oil mixed with a few drops of lavender and frankincense essential oil after I've dried off. And for my face moisturizer, I mix about 2 ounces of jojoba oil in a glass bottle with 5-7 drops of skin-friendly essential oils (usually lavender and frankincense) to make a serum that is just as effective as those that cost hundreds of dollars at a department store. When I feel like pampering myself or need a little TLC after a hard day, I opt for homemade whipped body butter instead! Trust me, when you realize how easy it is to make most of your DIY beauty recipes, you'll never go back! For more DIY moisturizing options, try these easy recipes: homemade lotion and whipped coconut oil. Over six months ago I stopped using store-bought deodorant. If you're wondering why, it's because I had an epiphany and finally started listening to all the warnings. The realization was this: once I put commercial deodorant on, if I didn't shower for several days, my pits didn't smell. I used to think this was a sign of an excellent product. How stupid of me. After several days of vegging out on my days off (hey, I was in college and I'm kind of dirty hippie) my hair would turn greasy and I would start to stink slightly. Everywhere except my underarms. Something was off. Why would my pits be an exception? Because I was slathering them with a product containing aluminum, which temporarily prevented me from sweating and thus smelling bad. Except it wasn't so temporary, as it lasted several days. And since I eventually realized that you detox through your skin when you sweat, I would rather not plug up my body. Not to mention the other questionable ingredients in deodorants like phthalates, propylene glycol, parabens, triclosan and synthetic fragrances. I'm never going back to that stuff! 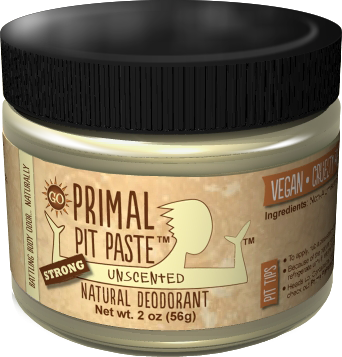 I now use an all natural brand from a small company in Florida called Primal Pit Paste. I frigging LOVE this stuff! The active ingredient, believe it or not, is simple baking soda! I bought my first jar back in November and have only use 1/4 of it. You only need a pea-sized amount under each arm, so it lasts practically forever! You can buy it directly from them or on Amazon, if that float your boat. If you'd like to learn how to make your own with a few basic ingredients try these tutorials: homemade deodorant stick, deodorant for sensitive skin and mineral salt deodorant spray. Note: For all the DIY recipes listed in this article, I recommend using 100% pure therapeutic grade essential oils. Click here to find out how you can get the highest quality oils for wholesale prices. Sign up for my (FREE) Essential Oils 101 E-Course! Every day for 14+ days, I'll send you a special email newsletter packed with information on the WHAT, WHY and HOW of essential oils, plus an introduction to some of my favorite (and most versatile) everyday oils! *The image is used freely according to it's creative commons license via flickr & has been changed by me for the purposes of this blog.